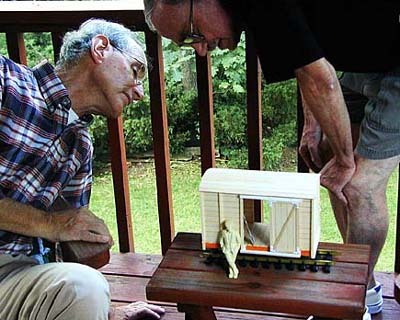 These models are BIG–about 1/13 full size. 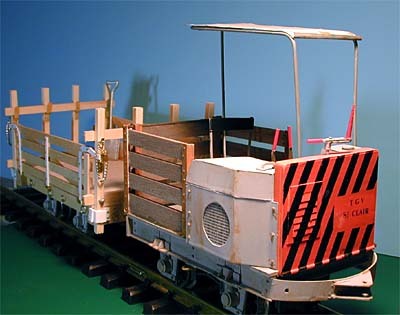 They run on G scale track at 1-3/4″ gauge, but they treat it as two-foot narrow gauge metals. Thus, the scale is 7/8″ to the foot. Shown here are my first models in 7/8″ scale, some of them still unpainted. They’re mainly intended for running in the garden. Locomotives are normally either battery powered or live steamers. My locomotive, shown above, is a model of a French locotracteur made in 1923 by A. Petolat, of Dijon. The prototype runs on a converted Citroën engine and is only two meters long. The 1/13 sized model is under 7″ in length! 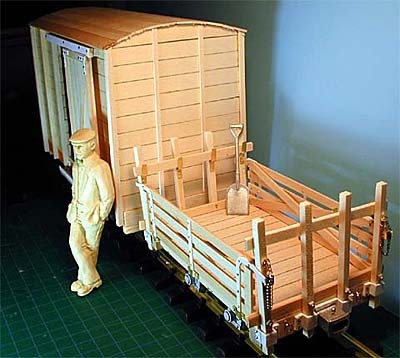 The open wagon is from World War I, a P-class wagon used for general-purpose hauling. 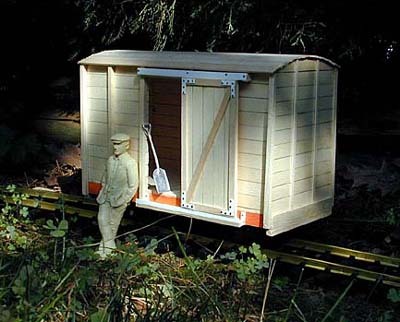 The box car is a freelance design, based on various two-foot (60 cm) gauge wagons in use in France c. 1930. For size estimation, each square on the green floor mat is 1/2″. Here’s the box car in its natural habitat, the garden. 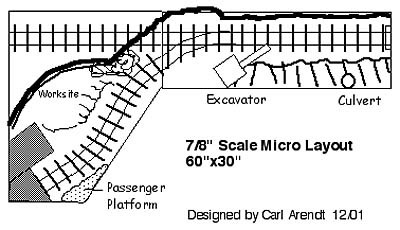 However, I’m also working on a small, micro layout for these behemoths. The plan is shown below…it will be about five feet long and 2.5 feet wide. Operation will be somewhat limited, but at least the little diorama will provide a place to show off the models during the long winters here in the U.S. Northeast! I’ll post more photos as work on the layout progresses. Meantime, you can learn more about this remarkable scale at Steve King’s website.